It is a dance contest aiming at making the future dance scene more exciting for children. Organized by LDH JAPAN, DANCE CUP started in 2014 as a social contribution activity. DANCE CUP provides a place for children to show their talents and build a future full of smile for them. In 2018, the content of the contest has been renewed and we will put even more effort into supporting children all over Japan who work hard on dancing. DANCE CUP is a street dance contest for elementary school and middle school students. Started in 2014, this year the contest welcomes its 5th year. In order to let children dance with a big dream in their hearts, DANCE CUP sets a goal and provides a place for them to show their talents. Every year, LDH holds preliminary contests across the country from Hokkaido in the north to Okinawa in the south. Many children have participated in this contest so far and the atmosphere at the venues is always exciting and inspiring. We also prepare "a dance study trip to New York or Los Angeles" for the champion team. The champion team will get an opportunity to take lessons, communicate with dancers and participate in dance battles in the birthplace of dance. We provide precious experiences which motivate children to have even bigger dreams. DANCE CUP provides support for children who work hard on dancing. DANCE CUP is a dance contest held for children who aim to become the number one in Japan. DANCE CUP is held as a part of LDH's social contributions that can only be made through entertainment. But we aim not only at children's participation. We also want to make contributions to the society by providing a place where we can revitalize local communities and dancers can communicate with each other. From Hokkaido in the north to Okinawa in the south, preliminary contests are held in 15 areas in Japan. The contest is divided into an Elementary School Division, a Middle School Division and a High School Division. Each team should present a 2-minute performance full of their passion for dance! All finalists will compete in the finals! Winning teams in the preliminary contest of each area will enter the finals. 15 teams from each division selected in the preliminary contests will enter the finals. National champions will be decided from these 45 teams in the finals held in Tokyo. The best teams that won the preliminary contests will compete fiercely with each other in various kinds of dances including hip-hop dance and jazz dance. Winning teams of each division will receive the opportunity to learn dance in New York for 7 days. DANCE CUP will welcome its 5th year in 2018. 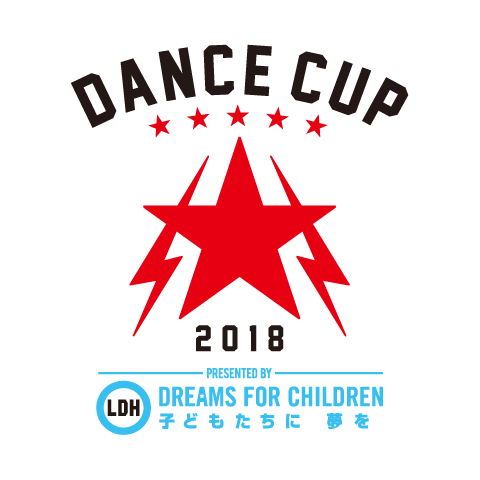 Under the theme of "Dreams For Children" which is a LDH's social contribution project, this year we will also hold DANCE CUP in cities across Japan with the idea "gratitude to dance". While seeing children's determined looks during performances every year, I am inspired by their bravery of taking on challenges. DANCE CUP provides a place for children who are the future of our country to pursue dreams, accumulate experience and realize their dreams. I hope DANCE CUP can let everyone perceive the importance of having dreams and pursuing them. Are you having fun while dancing? I am looking forward to seeing the best dance performances in DANCE CUP this year!! I believe that people will grow at the fastest speed once they have clear goals and strive for them. Be sure to cooperate with your friends, enjoy the music and do your best! This year, DANCE CUP will welcome its 5th year! Every year, we can meet many excellent dancers in DANCE CUP which is becoming more and more exciting! It is a wonderful dance contest worth expecting! All the participants can meet here, compete with each other and learn from each other through dance. They will gain valuable experience in DANCE CUP! Therefore, as a member of EXILE I will do my best to make DANCE CUP more exciting! I will wait for you at the venue of the national finals! This time, DANCE CUP will welcome its 5th year! It will be divided into elementary school and middle school divisions in 2018! I am looking forward to watching intense contests this year! In the current dance scene in Japan, children are very active and eye-catching. Therefore, I hope they can take DANCE CUP as an opportunity to get various experiences and feel the atmosphere as dancers! Be sure to do your best!! But most importantly, please enjoy dancing! !